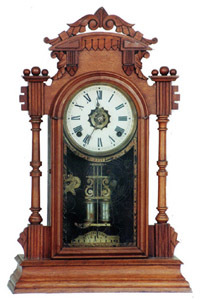 Ansonia Clock Co. parlor clock, "Carlos", ca 1880. 8 day, strikes hourly on a gong, alarms on an iron bell, running. Movement and beat scale are signed. 22 inch walnut case of unusual design, credited to H. J. Davies influence. Pendulum and glass are typical Daviess. Old paper dial probably a replacement. Needs some light cleaning and NuLife to enrich the nice walnut grain. Backboard covered with paper. Ly-Ansonia No.1783.